← Wanna see a dancing parrot? Also, I have my own pets in the backyard: My two free-range box turtles, Timmy and Tommy, always have free run of the backyard. We give them fruit and vegetables, but they also like to eat whatever goodies they can find, including bugs and worms. 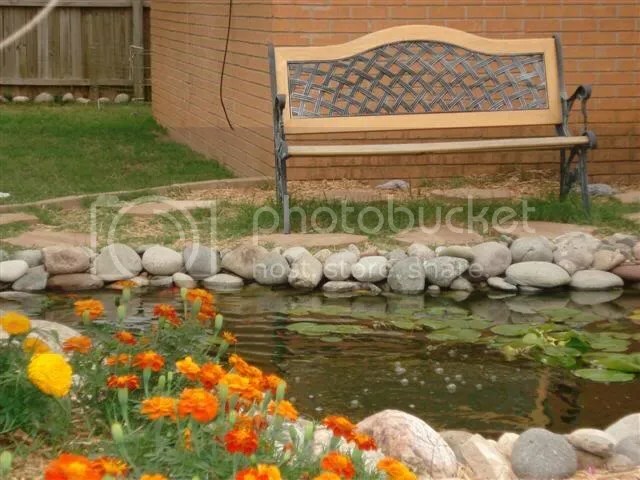 I also have my forty-something goldfish in the fishpond my hubby built for me. I love to watch them swim around. It’s very relaxing! My two bunnies, Cadbury and Hudson, have a nice, private yard of their own, but when I am outside I open their gate and let them romp through the entire backyard. I love to watch them run laps around the pond. They climb up on the hillside where the waterfall comes down, and play King of the Hill, then jump over the waterfall and keep romping. They are very athletic and fun to watch. Then, of course, I have my three dogs. They patrol the fence and make sure there are no breaches in security, like a squirrel on the fence, for instance. Belty often gets up in my hubby’s chair and sits by me. He’s my big boy. Then, of course, I always have at least one of my pet birds with me: Most always Penny, my cockatiel who is bonded to me. Also, Rufus, my African Grey Parrot, is most always outside with me. Others come out with me from time to time. Rufus loves animal sounds. When he is outside, he loves to copy the wild bird calls. He also loves to watch birds flying overhead. And, when the dogs bark at squirrels, he whistles for them. He’s very handy to have around! My hubby recently bought me an iPod Nano, and I uploaded my audio Bible on MP3. So, I’ve been enjoying listening to God’s word while I enjoy watching God’s creation. I also love to crochet and I bring out my latest project. I’ve been outside in the backyard in my spare time. I’m enjoying Fall while I have a chance, as it is getting colder and colder every day. The high today will be 56 degrees Fahrenheit. Winter will be here soon and it will be very cold outside. The turtles will be hibernating, the pond will be frozen over, the fish will be inactive, and the bunnies, the birds, the dogs and I will be inside where it is warm. Then, I have to wait till Spring when I can go outside and enjoy God’s creation again. Spring is when baby birds are hatched and their parents bring them to our pond for a drink and their first bath. I love to watch the clumsy little things learn to fly and find their own food. So, next Spring, I’ll be out in the backyard again.